Fried hard boiled eggs are hands down my brother’s favorite holiday food. I love them too, but he can put them away with alarming speed. We’ve had occasions where his plate is just a pile of yolks (he only eats the egg whites) with almost no other food on it. The almost unpronounceable Egyptian name for them is Baid Maza3lil (that “3” in the word represents a sound we don’t have in English that comes from inside the throat) or Baid Mezaghlil. Fried hard boiled eggs can also be found in many other cultures as well, such as in Asia or in the southern U.S., but no matter what you call them, fried hard boiled eggs mean that it’s Christmas or Easter at my house. Some people hate hard boiled eggs. I like them, but I can understand why they might turn some people off. On the other hand, I would suggest that people who don’t like hard boiled eggs might want to try these eggs. The reason is that when they’re fried a bit on the outside, the texture and flavor changes. 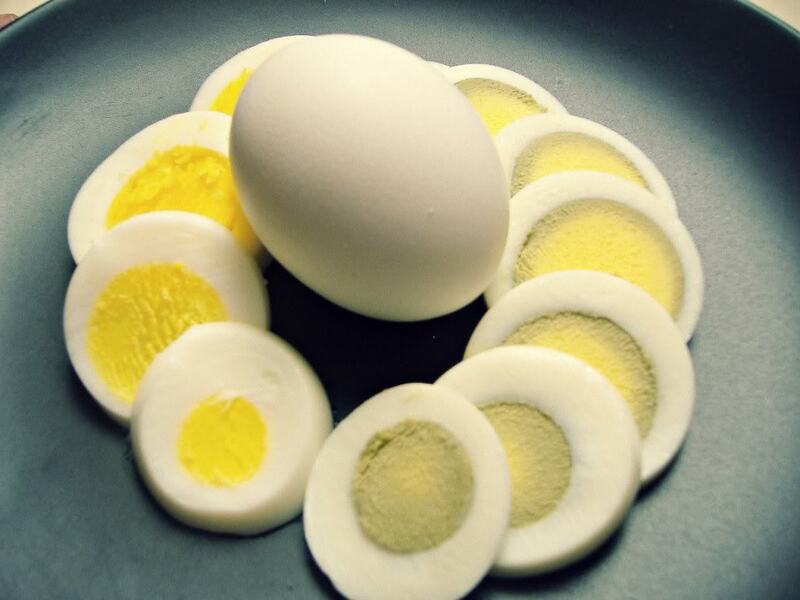 These could be the hard boiled eggs that hard boiled egg haters love! Or not. Either way, try them first. At first glance, the “recipe” for making these bad boys might seem incredibly obvious and for the most part, it is. Hard boil some eggs and fry them up, right? Nonetheless, if you’re not careful with your technique and cooking times, you can end up with poor results. Over the years, we made some mistakes that can yield burned or rubbery eggs. What’s interesting is that despite the fact that these are fried eggs, the solid outer egg whites don’t seem to absorb much oil at all, which keeps the calorie count lower than one might expect from fried foods. Makes any number of large eggs at roughly 90 calories per egg. 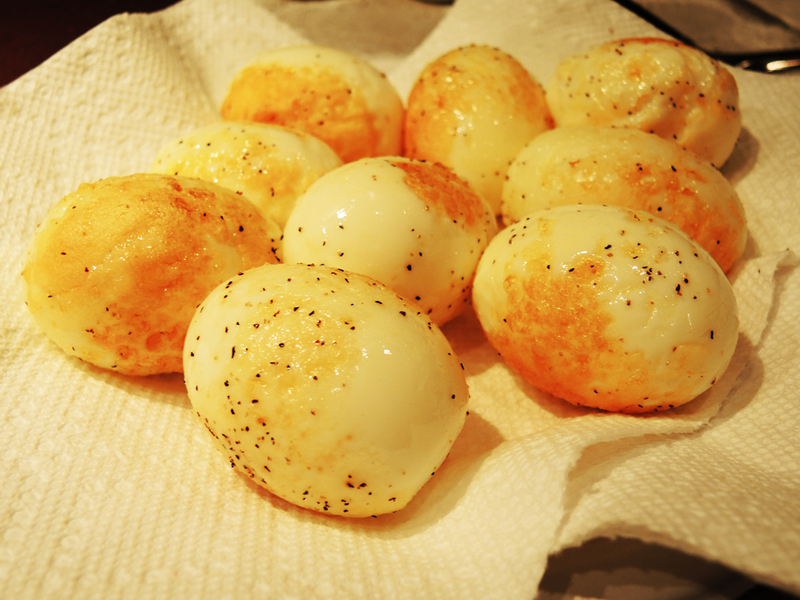 Fried hard boiled eggs dusted with black pepper. Depending on how many eggs you have, place them into a large or medium pot and then fill the pot with water until the eggs are covered, but the water isn’t at the top (you don’t want the water to spill over when it boils). Note: One important detail here is that the best way to boil eggs is to bring the water to a boil FIRST and then add the eggs to the boiling water. This makes them fantastically easy to peel. Nonetheless, this isn’t ideal if you are trying to cook a dozen eggs or more at once. That’s the only reason I recommend putting the eggs in the pot first. 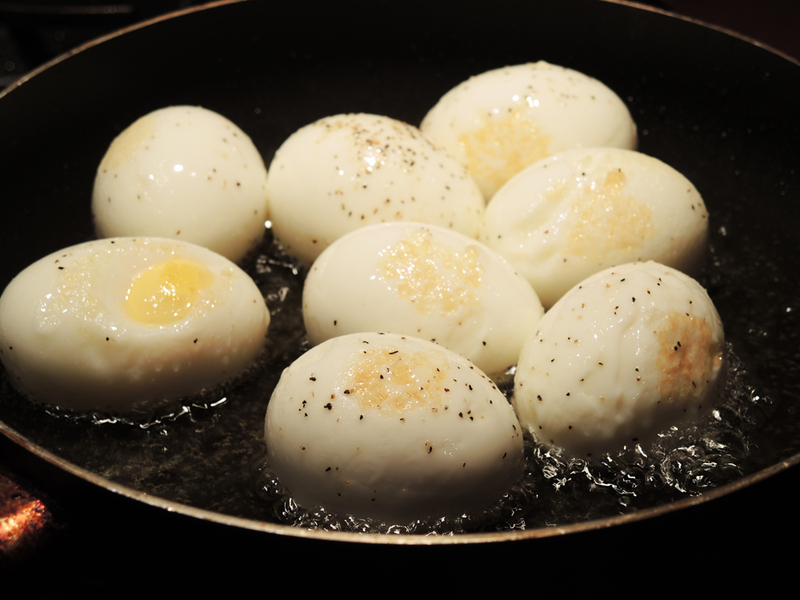 If you are only boiling a few eggs, boil the water first, then add the eggs carefully using a slotted spoon, and boil for 9 to 11 minutes depending on how you like the yolk. Bring the water with the eggs in it to a boil and let the eggs boil like that for about 2-3 minutes. Turn the heat off and let the eggs sit in the formerly boiling water for 5 – 10 minutes depending on whether you have only a few eggs or a lot of eggs respectively. 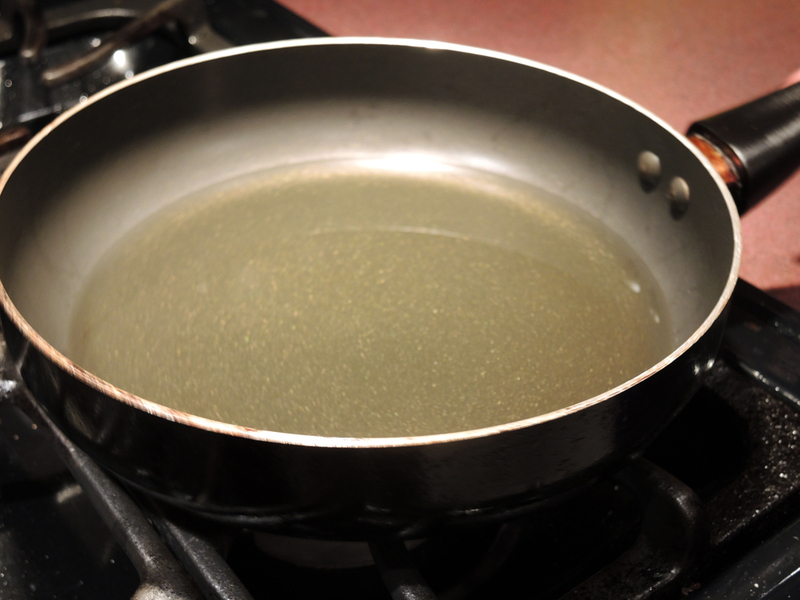 After 5 or 10 minutes, immediately remove the pot from the stove and carefully empty the water into the sink. Fill the pot with cold water to stop the eggs from overcooking and to cool them off so you can peel them. Repeat this process until the eggs are warm, but easy to touch comfortably. Note: If you over-boil the eggs or let them sit in hot water for too long, you’ll end up with weird gray-green yolks instead of a wonderful bright yellow. The gray-green yolks taste fine, but they don’t look as nice and they can be a little more dry. Carefully peel the eggs and place the peeled eggs on a tray or large plate covered with paper towels. I tend to get impatient when peeling and that sometimes results in torn or messy egg whites, so take your time. When all the eggs have been peeled, cover them with paper towels and dry them off as much as possible without bruising them. Since you’ll be frying them later, you don’t want any water on them to avoid unnecessary oil splattering. 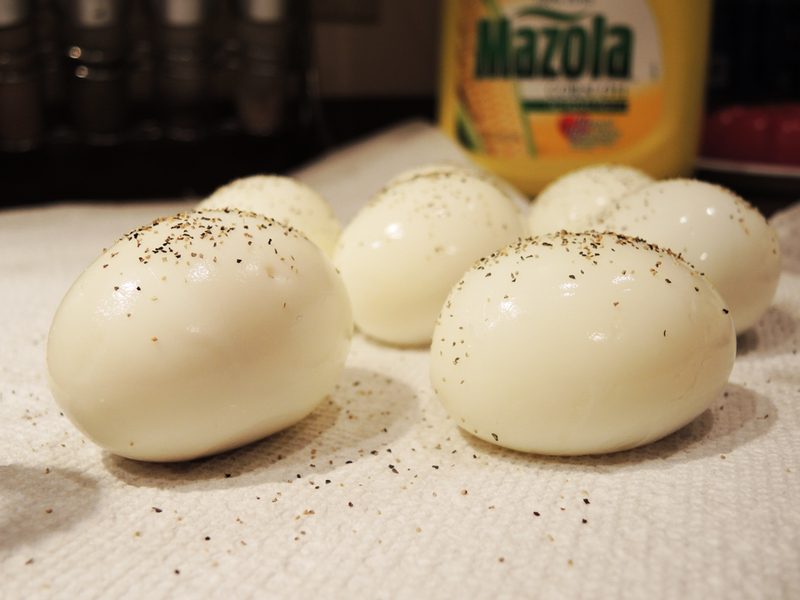 After drying the eggs, lightly dust them all over with crushed black pepper. Roll the eggs around to make sure you get all sides. Fill your frying pan with about a 1/4 – 1/2 inch of vegetable or olive oil. We usually use vegetable oil because it lets you really taste the egg, but olive oil adds another dimension of flavor, so I would recommend trying both. Set the stove to medium or medium-high heat to get the oil hot. You don’t want the oil to smoke, you just want it hot enough to just get a lazy fry. A good way to test whether the oil is hot enough is to dip the handle of a wooden spoon in the oil. If bubbles form around the wood, then the oil is ready. Carefully place the eggs into the oil using tongs or a slotted spoon. If the eggs start to splatter or burn, then your oil is too hot. If the eggs are just rolling around and there are no bubbles at all, then the oil isn’t hot enough. Adjust accordingly. After 2 or 3 minutes on one side, carefully roll the eggs onto their opposite side and brown them on that side as well. You don’t want to to fry the whole egg or get crispiness all over. If you fry the whole egg (especially if you overcooked the eggs in the first place) then you can sometimes end up with a very rubbery outside that has an unpleasant texture. The best method is to fry two sides of the egg and leave it at that. Note: You can see in the picture below one of the eggs that ripped when I was peeling it. Don’t worry, just go ahead and fry them up. They’ll still taste good and give you a little variety in the bunch! 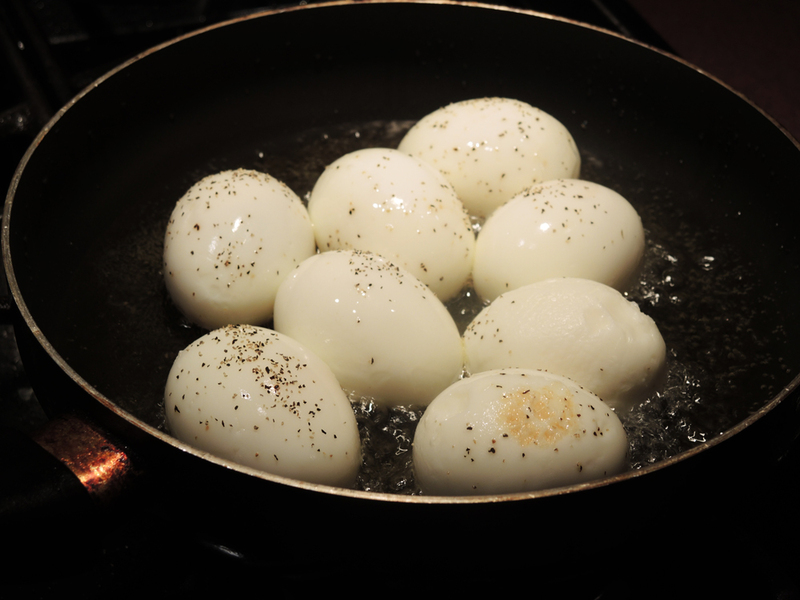 After browning the eggs on each side, remove them and place them on paper towels to remove the excess oil. After letting them cool a bit, they are ready to serve. Try them with a little salt or use them to make the weirdest egg salad you’ve ever had the next day. They’re great hot or cold and they re-heat pretty well, but they’re best eaten when fresh. Dip them into different spice blends for added variety. what if you battered it and deep fried it? Then you’d be ready to set up a booth at a carnival next to the fried twinkies and custom fried T-shirts. We braise hard boiled eggs along with pork. Actually its a fine dinning delicacy in japan. They freeze the eggs this also makes it easy to peel off the shells. Then they coat the whole egg in tempura batter and breadcrumbs. They then deep fry it for a few mintues. When done you got a golden crispy outside with a warm gooey inside. And the flavours are phenomenal! That’s the same thing I wanted to know but will they burst/explode after cutting them open? I have never battered and deep fried an egg. I assume that you could do it. You would just have to pull the egg out as soon as the batter was golden brown (keeping in mind that the egg is already cooked). The egg shouldn’t explode though and I’ve never had these explode. Nonetheless, if you are concerned about it then just let the eggs cool for 10 minutes before cutting into one. Yowza! Haven’t seen fried hard boiled eggs before! Love it. Bizarre indeed. But, a great idea. My wife sent this to me in an e-mail link thinking it was funny, but the yolks on her because I think it sounds Delicious! You would be correct, sir. Tell your wife to give them a try before she emails joke links all over the place! I live in the South. Why haven’t I seen these yet? I have never heard of frying a hard boiled egg, but I will definitely try it. May I make a suggestion?You have the technique for making a perfect hard boiled egg down perfectly, but if you crack the eggshells then drop the eggs into clean, cold water, they will peel ‘cleaner’, the membrane between the shell and the egg white will loosen and most of the time, the egg will not stick and tear with the shell. Wow… that’s a great recommendation for peeling the egg. I’ll be sure to try that next time! Thanks for the tip! I boiled them, then used an egg slicer to cut them, then fried them in 1/4 inch of oil. They came out quite oily and the oil foamed up. Not especially tasty. Interesting idea to slice them, but that’s exactly what you should never do. You absolutely should not slice the eggs before you fry them. I’ve seen a guy do that on YouTube, but he batters his eggs so again they aren’t exposed to the oil like that. I’ve also never seen the oil foam when making these eggs, so the problem is probably that you sliced the eggs first and maybe the heat was a bit too high? Sorry your experiment didn’t work out, but thanks for sharing the results! This is great! There is an egg curry Bengali (Indian) dish that uses fried hard boiled eggs. I first learned about it fro my mother-in-law, and people go crazy whenever I cook it. Your technique for boiling and frying is more refined than what I learned from her (ie. “boil eggs and fry them in oil”). I’m excited to try it out. Rolling the eggs in pepper has also given me inspiration as far as different spice combos I can use to spice the egg skins themselves I addition to the curry. Cayenne? Ginger? Cumin? Cinnamon? I’m making this dish for a curry throwdown tonight and I can’t wait to see the result! I’m glad you enjoyed the post! Please let me know how the eggs turned out. I’m also very interested in the Bengali Curry Eggs. Could you share that recipe with me? The curry was great! I didn’t win the throwdown, but everyone loved the eggs. Thanks! To make the curry, lightly smash 2 cinnamon sticks, 3-4 cloves, 3-4 cardamom pods (my MIL calls this the Holy Trinity) and fry in hot oil with 2 bay leaves until fragrant and turning color (less than a minute). Add a medium sliced onion and fry until its got some nice color. Add 1T grated ginger (or paste, if you have it) and 1t minced garlic (or paste) and then turn heat down a bit and cook for a few minutes. Dice a medium tomato and cook it until it’s blended in and mushy, about seven minutes. In a bowl, combine 1T ground cumin, 1T ground coriander, 1/2 of a fresh green chili, 1/2t turmeric. mix with some water to make a paste/slurry, add it to the pan and cook for a few minutes until well mixed in. Add in a few potatoes cut into large chunks, almost as big as the eggs, and stir until well mixed (I like to have at least as many potato chunks as eggs). Add 1C water, 1/2t sugar and 1/2t salt. Bring to a boil then simmer on low until potatoes are cooked. Add 12 fried hard boiled eggs, 1t garam masala & 1t ghee (or butter) and cook for another five minutes or so. If you can, let it sit for a few hours or overnight to allow the eggs to absorb the curry. We usually eat it with rice and dal. Wow… that sounds incredible. I’m not only impressed with the recipe, I’m impressed that you fit it all into a comment! Thanks! 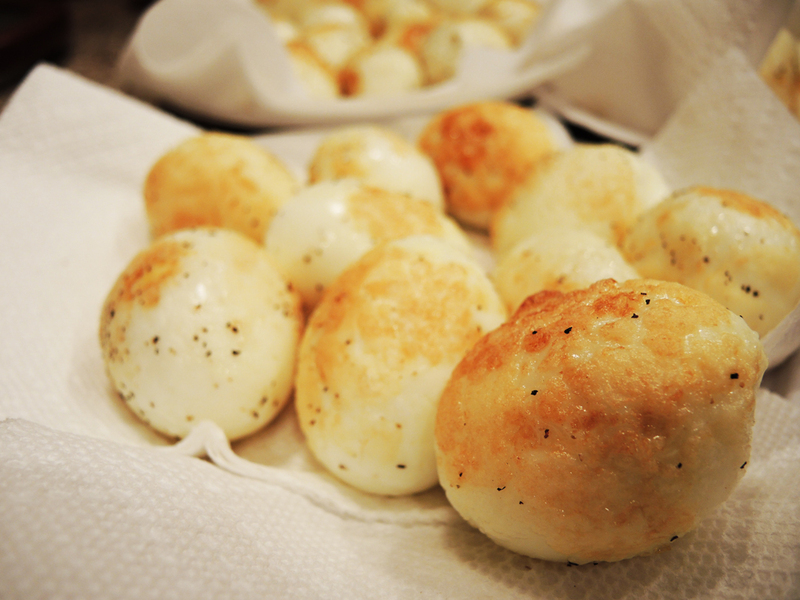 I’m also glad that the eggs turned out well and that people enjoyed them! When I’m feeling adventurous, I’ll definitely try this curry.